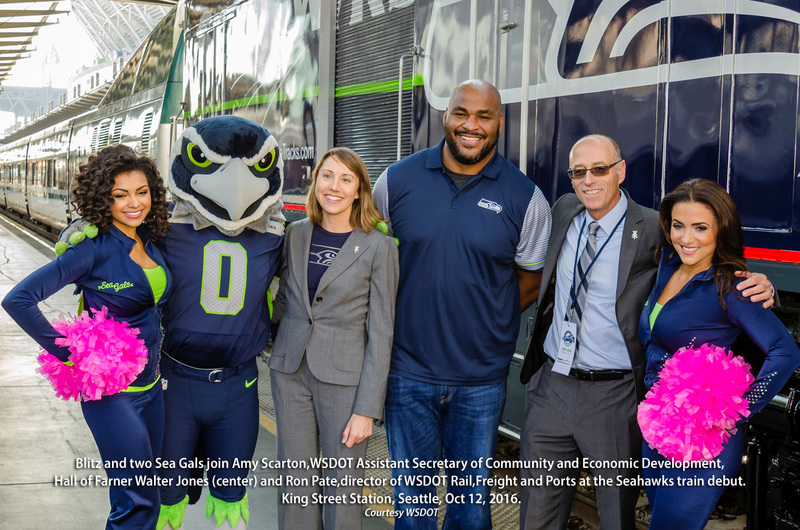 Members of the National Football League Seattle Seahawks team are involved with many facets of fans lives here in the Pacific Northwest. From outreach initiatives with youth, hospital visitations, football camps, and many other community interfaces, including fans up in Vancouver B.C! 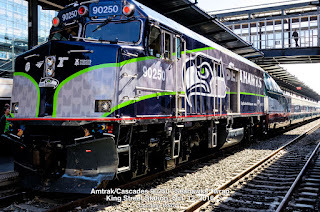 This is yet another example of the Seahawks lining up behind another worthy cause, what I call the railroad/human interface, protecting human lives from tangling with rail traffic. AMTK 90250 with a beautiful Seahawks vinyl wrap. 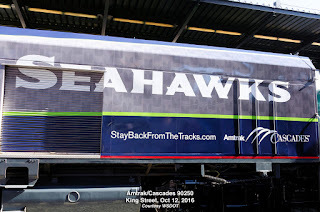 The Seahawks Amtrak Cascades service operates between Vancouver, British Columbia and Eugene, Oregon. 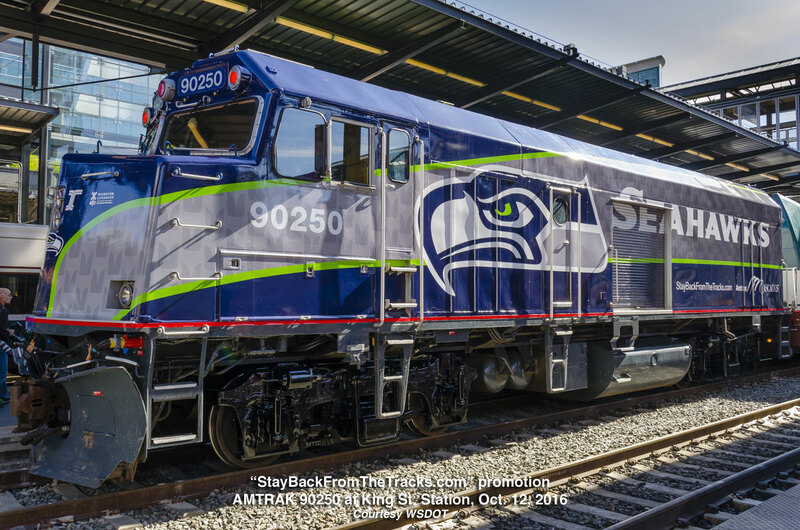 A significant realignment of the BNSF/Amtrak corridor will open in 2017 affecting rail traffic between the Puget Sound and Columbia River. With that change, high speed rail will be running through communities that haven't seen a train for years. More about that alignment later. 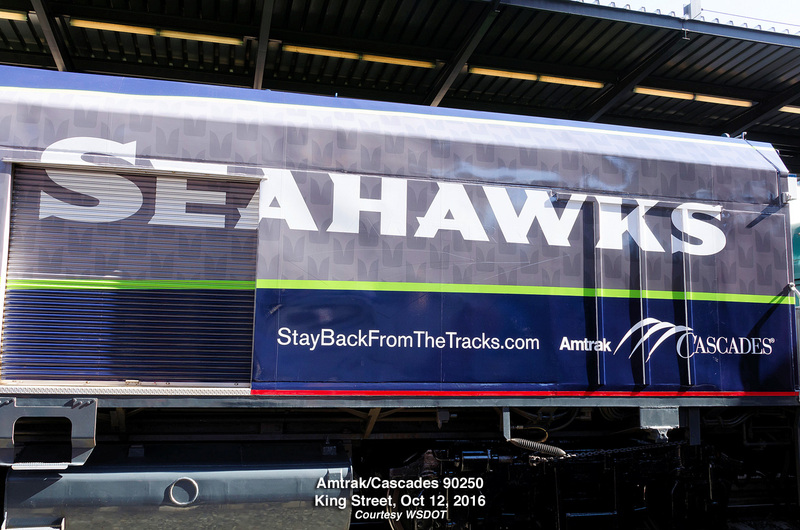 In conjunction with that alignment, the Amtrak Cascades/Seahawks partnership will formally launch the "Stay Back from the Tracks" safety campaign, with Seahawks wide receiver Doug Baldwin will serving as spokesman. Baldwin and the rest of the Seahawks organization will work with WSDOT and Amtrak Cascades to drive down the number of train-related fatalities and injuries by creating better awareness of rail safety for people to be more cautious and alert when around trains, tracks, and crossings. 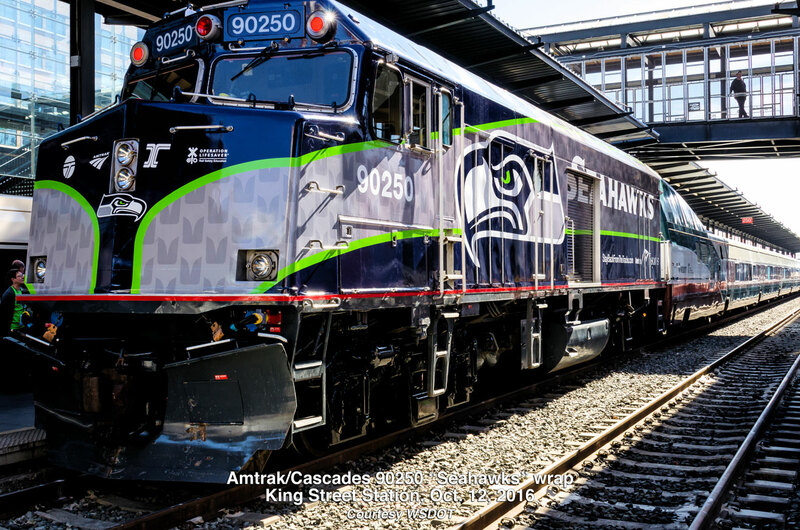 The train safety campaign is partnership between the Washington State Department of Transportation -WSDOT, the Oregon State Department of Transportation - ODOT, Operation Lifesaver, Amtrak Cascades and the Seattle Seahawks. Safety campaigns are being expanded in Washington state to try to keep more people away from train tracks. The efforts come after a record number of pedestrians were killed by trains across the state in 2015. 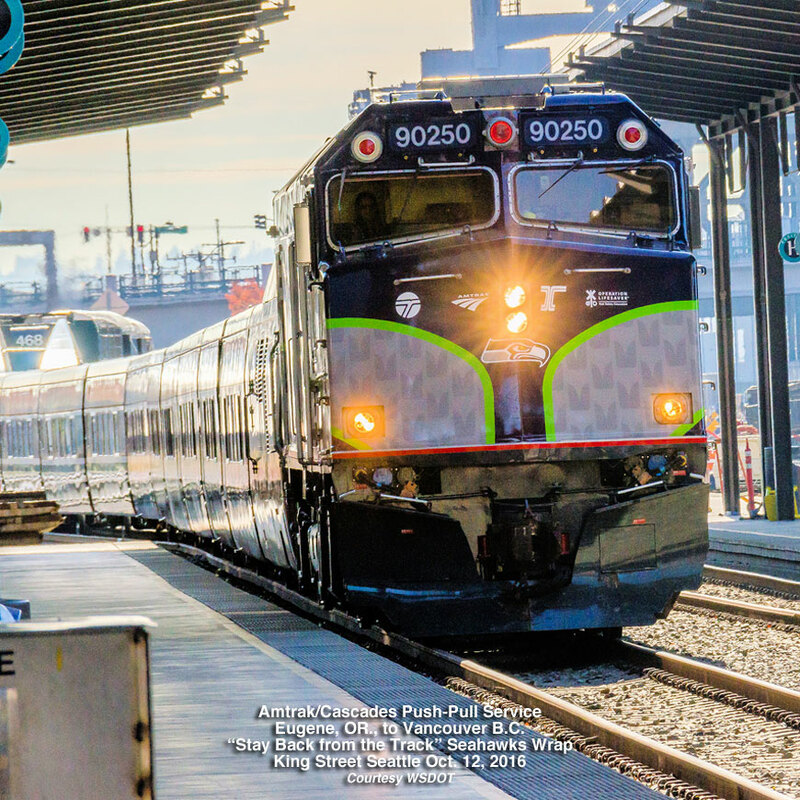 27 pedestrians were killed by trains in Washington state in 2015. About one-third of the deaths were the result of suicide. Other factors contributed to the rest, including people trespassing on railroad property, people not paying attention to their surroundings, the weather, and distractions from technology like cell phones. • Built as F40PH (F=full width cab, 40=3,000 hp, P=passenger, H=HEP, "hotel" power, supplying electricity for heat and light to the passenger consist. • Prime mover: EMD 16-645E3, 3,000 hp (2.2 MW), turbocharged. 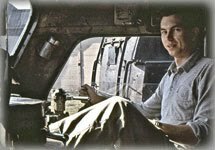 • Out shopped in 1977. Rail fans often dub this non-powered locomotive a "Cabbage Car." The Cabbage Car story follows. Robert, my aol program can't connect to some email links so my question has to come this way, I understand that Cascades service will have a new route shortly: can you tell me what the change will be as this comes about? Thanks. The Pt. Defiance Bypass will open in Oct 2017, according to my contact at WSDOT. I am preparing an "in-depth" article - which takes a significant amount of time to research and write.